Adobe, one of the most successful graphic software company brining out one of the very best for developers, rolled out the availability of a new runtime namely Adobe AIR for Android. The latest by Adobe has been made available for the developers all around the world, looking forward on bringing out apps for the Android Market. The Adobe AIR would be available in the Android Market and would be one of the most appealing applications being released for handsets running under Google’s mobile OS. 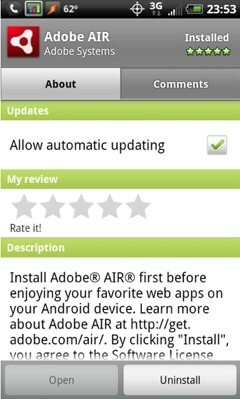 Adobe AIR will let you publish ActionScript 3 projects to run as native applications (.apk) for the Android OS. These AIR applications can be delivered to Android devices through Android application stores such as the Android Market. AIR apps can been used to build apps for Android using the Flash Builder or Flash Professional CS5. Users would need to download and install the solution in order for the apps to work. Developers has the access to write a new code or reuse existing web content to build AIR applications for the Android OS as the source code and assets are reusable across the Flash Platform runtimes which gives developers a way to more easily target othr mobile and desktop environments. First app has already rolled out known as AppBrain. Cool, now I can use my favorite AIR services on my mobile phone.